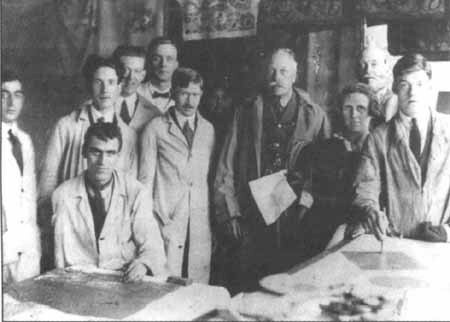 During the first World War a number of students from the Sheffield School of Art ran painting classes for the severely injured at Wharncliffe War Hospital on the outskirts of Sheffield. Seeing the therapeutic effect that these classes had on the men, one of the women, Annie Carter was inspired to try and set up a business that would be able to offer the men employment and support when they left hospital. She started by getting the men to make small craft items such as tea cosies and table mats that she sold to her friends. The men, many of them amputees, would later become skilled at their work producing a range of goods including~ handkerchiefs, shawls, scarves, dresses & lingerie, furnishing fabrics, ecclesiastical work & theatrical curtains. 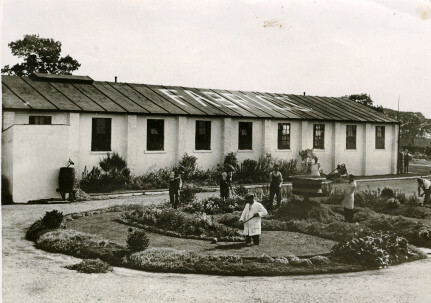 At the end of the war premises in Sheffield were converted and equipped as workshops and a few of the men taken on. 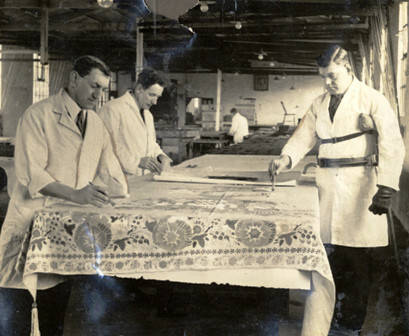 Painted Fabrics Ltd was formed in 1923 when land and ‘hutments’ at the old WAAC’S. (Women’s Auxiliary Army Corps) camp at Norton Woodseats were leased. Over the next 15 years a thriving community developed – initially huts were converted to homes for some of the men and their families and others turned into workshops, all adapted to the special needs of the ex-servicemen. In 1928 ten houses were built as Haig Memorial Homes. Gardens and allotments were provided and an air of back-tothe-land idealism pervaded the place. There were social and snooker clubs, fishing outings and a range of children’s activities such as summer fancy dress party’s and a Brownie pack. In the inter-war years Painted Fabrics employed as many as 67 men at one time, some for short periods, whilst others remained there all their working lives. The whole enterprise was supported by sales of quality fabric goods to a wealthy mainly upper middle class clientele that was encouraged to buy goods at exhibitions organised by Mrs Carter. Three different types of exhibitions were organized ‘public’ events in Townhalls, private “at homes” held by aristocratic ladies and an annual exhibition at Claridges in London. So successful were these exhibitions of the companies work that they competed with Henley & Wimbledon in the social calendar. The workshops were taken over to produce aircraft parts during WW2. Fabric production resumed in 1950 but never again reached the scale achieved in the 1920s and 30s. Though some men injured in the Second World War were taken on, those who had fought in the 1914-18 war were growing old and in I 958 the decision was taken to wind the company up. The site is now occupied by sheltered housing. 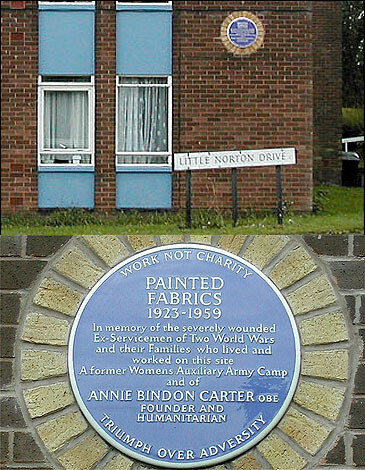 Plaque dedicated to ‘Painted Fabrics Ltd Little Norton Drive, Sheffield. The archives of the company were given to Sheffield City Libraries together with some examples of the work produced. This entry was posted in Early 20th Century and tagged 1940s, 1950s by chris-coates. Bookmark the permalink.